My Majorca beach holiday has to be one of the most disappointing, uninteresting yet funniest trips I’ve taken in quite some time. 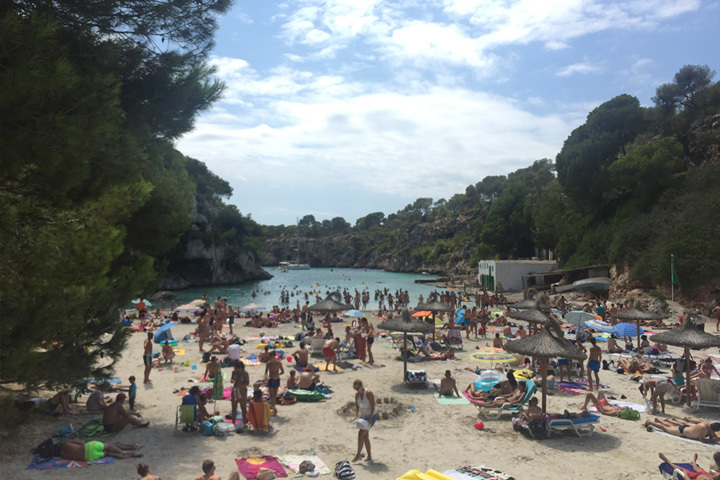 Majorca is the land of the holiday resort and spending one week on a Majorca beach holiday was akin to being trapped in some American family comedy. The island is located in the Balearic and can roughly be divided into two, the German half (North East) and the English half (South West) yet there are also pockets of Dutch, Russians, and apparently some locals as well. 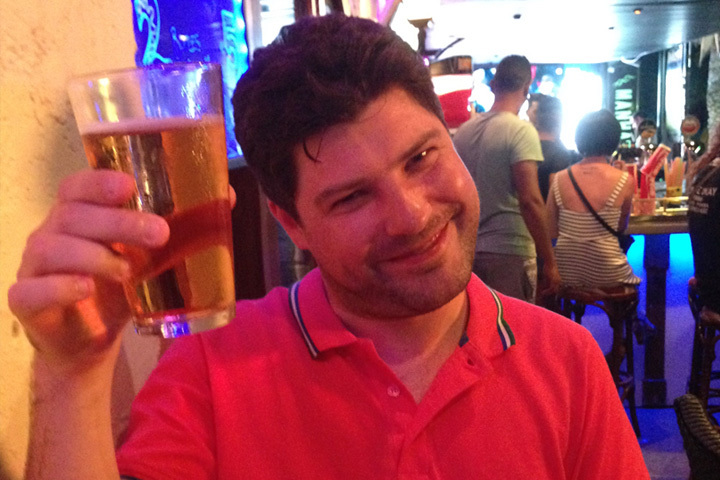 I had a Majorca beach holiday in August 2015. I had randomly selected two hotels for the duration of the trip based on a guide I had read about best beaches and factoring price. Unwittingly this divided our Majorca beach holiday into two distinct chapters: Beach Boredom and Hot Hangover. However despite the different feels, a key theme throughout the holiday was a lack of culture and tradition that was only partially compensated for by the abundance of beaches. The first part of our trip I like to refer to as Beach Boredom. This was spent on the German half of the island in Cala Ratjada where we soon fell in sync with the regimented pattern of other holiday makers. It was along the lines of breakfast by 8.30am, lie like a dead body by the pool for several hours, go for a snack and tipple at some Italian cafe, and finally finish the evening with dinner in the hotel and to bed by 10.30pm. I had made a reservation at the Vincci Bosc De Mar hotel however when we arrived they had misplaced our booking and had no spare rooms. They offered us one nights stay at the nearby Bellavista Hotel and an upgraded room and free dinner vouchers for the rest of our booked stay with them, which we gladly accepted. Bellavista Hotel, where we stayed for the first night was close to Cala Gat beach but a big step down from the comfort we were expecting. The beds were rock hard, the blankets and pillows were flimsy, and using your mobile phone in the bar or restaurant was prohibited, which made things a little awkward given the free wifi didn’t quite reach the bedroom. However it was only the start of our Majorca beach holiday and we didn’t mind because the weather was gorgeous and we just wanted to relax outdoors. As we had arrived in the afternoon, we went for a leisurely walk along the coast and into the city centre, stopping for a cocktail here and there along the way. 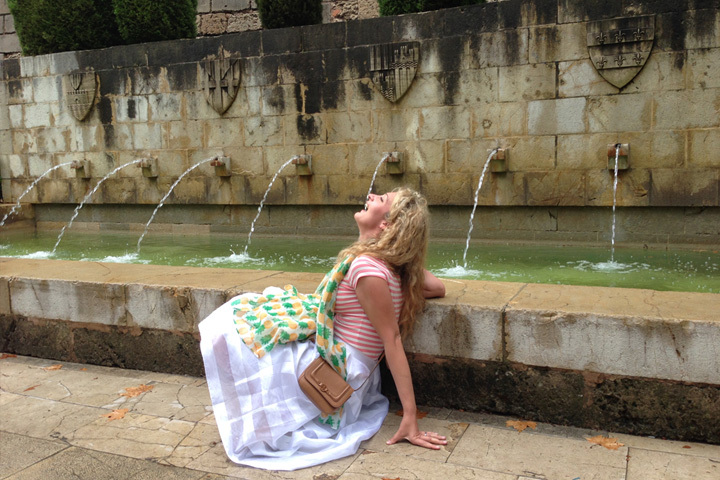 It was at this point a slow realisation that we were not going to soak up any Spanish culture started to dawn on me. There were more Italian and German restaurants than Spanish eateries, and every bar, diner or lounge had menus written largely in German. Nowhere served real tropical cocktails. 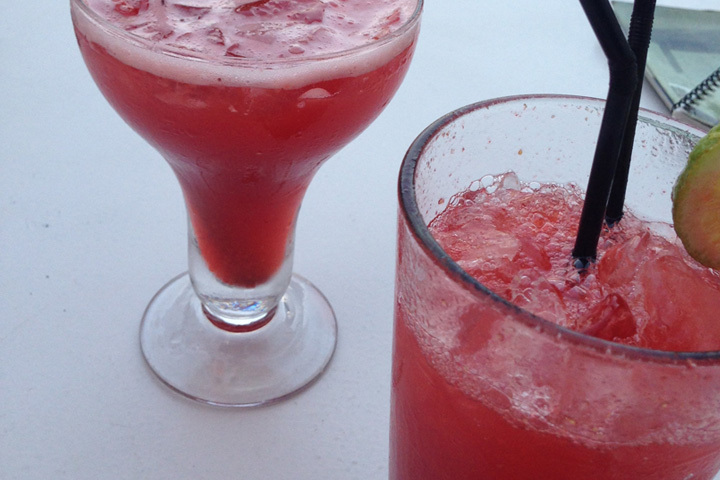 Some of the cocktail menus seemed promising at first glance, but anything we ordered was so sickly sweet and lacked real fruit that wine became a better choice (don’t be fooled by the deceivingly good picture of the strawberry daiquiri below). 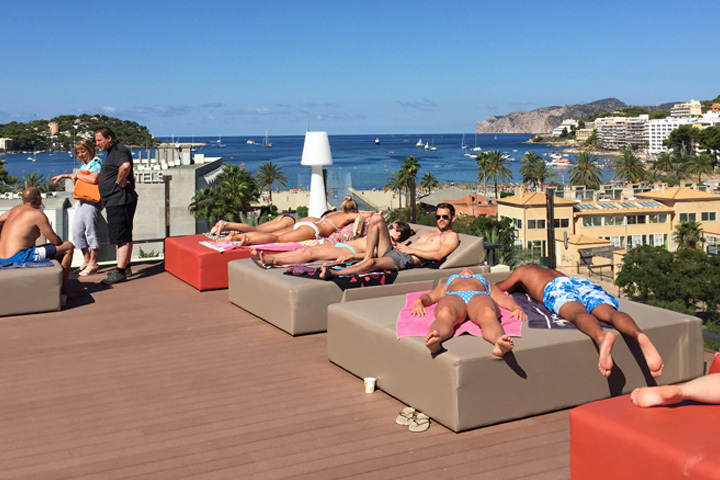 When we received our upgraded room at Vincci Bosc De Mar the next day, it was worth the wait. We had a plush bed, modern bathroom and a balcony overlooking the pool and sea. However it didn’t escape our attention that we were staying in a German colony. 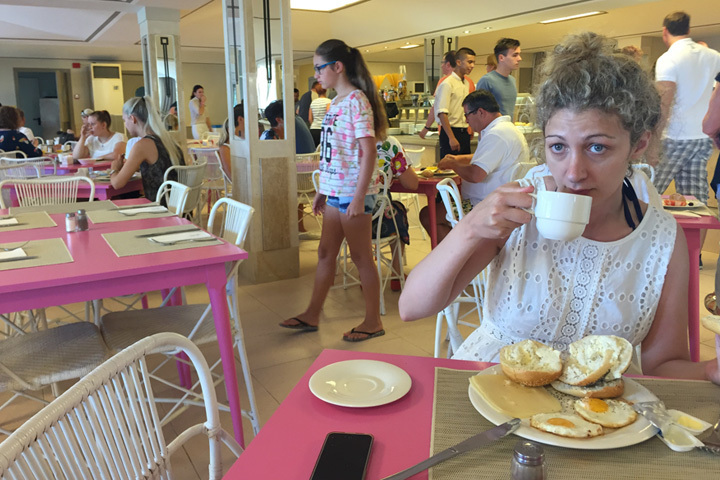 On our first morning we spent an hour by the hotel pool drinking espresso when a young Italian girl who was the hotel’s Activity Manager skipped up to us. She was quite excited to meet some new nationalities and commented how easy yet dull her job at the hotel was because the guests were disinterested in partaking of any activities and preferred to bake by the poolside. In Cala Ratjada you are spoilt for choice in terms of beaches and beach accessories. Almost everyone uses a floatable bed or toy in the water so we also purchased one for 10 Euros. 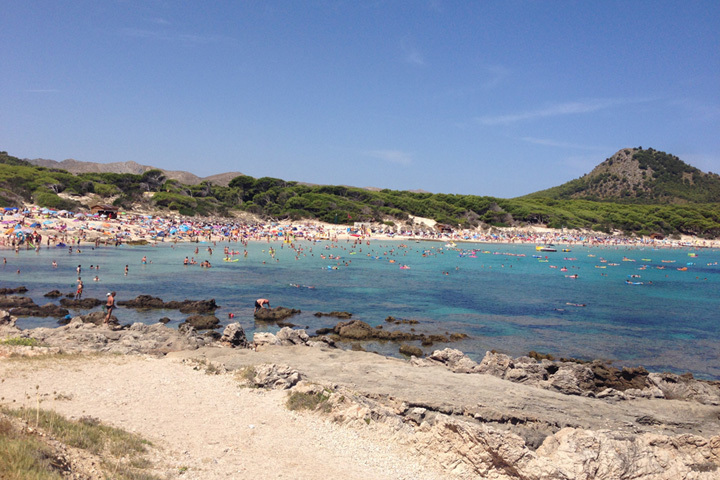 My favourite beach here was Cala Agulla Beach, which is reached by a pleasant walk along the Mediterranean. The water is warm and shallow, there is a decent atmosphere, and it has a bar and restaurant, which although not very cheap, is great for an afternoon snack. The other beach I liked in the vicinity was Cala Mesquida, which is more of a drive to get to but it has a wide shore more than 300 metres in length and is amongst natural surroundings of sand dunes and pine trees. 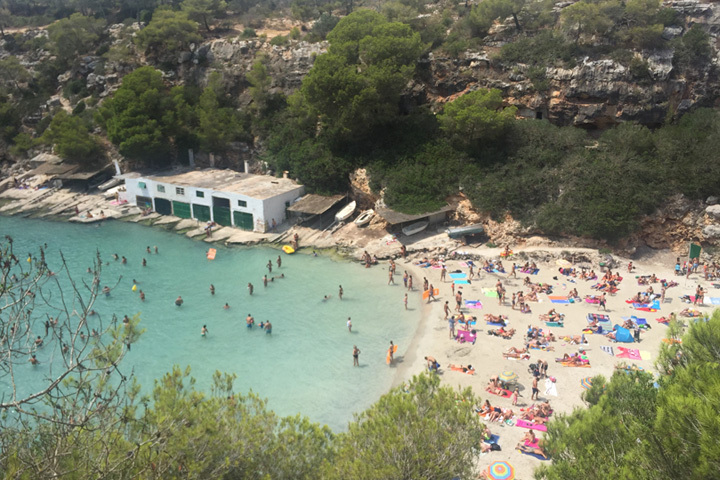 The beach is protected because it is home to one of the largest colonies of gulls in the Balearic, although you wouldn’t realise it as it has its fair share of sunbeds for rental too. 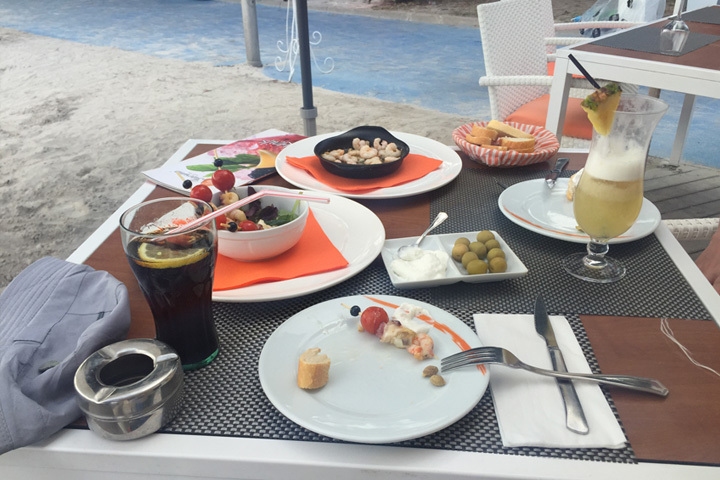 For the majority of our stay in Cala Ratjada, we took advantage of the free dinner vouchers we received from the hotel and dined at their restaurant since we hadn’t been very impressed by the restaurants on the island and we were on a budget. It was surprising to see that most of the other hotel guests did the same, as we always saw the same faces in the evening as we had seen earlier at breakfast. 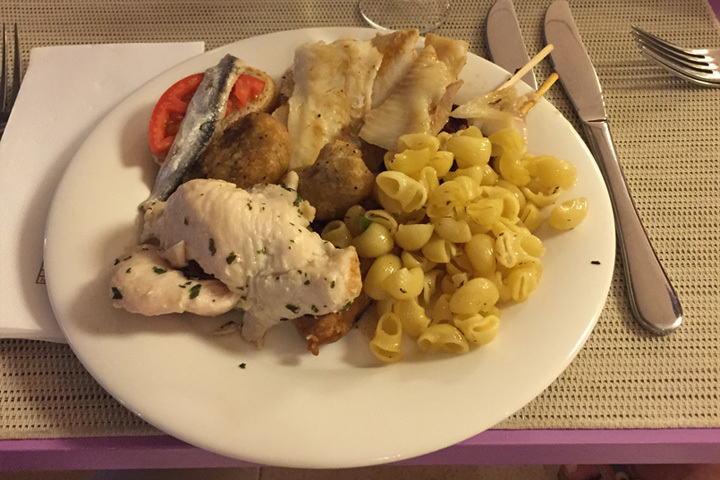 The hotel put on a slightly above average dinner buffet and highlights included squid ink paella, steak and cold cuts, but it was nothing exceptional. Evenings in Cala Ratjada were dull. In the hotel there were two bars, one near the pool and one inside. The hotel put on some light entertainment during the evening. One night they had a Spanish singer with a great voice and sparkly dress singing American hits from the 1990s, although kept mispronouncing the words. Entertainment and drinking at the hotel was wrapped up early and people in bed by 10.30pm. Out on the streets there wasn’t a big improvement either, although one evening we came across a fantastic musical duo singing Spanish and English reggae and dance at Treff Robert bar on Carrer de l’Agulla. The bar served drinks past midnight. On our last day staying at Cala Ratjada we made a day trip to Alcudia. 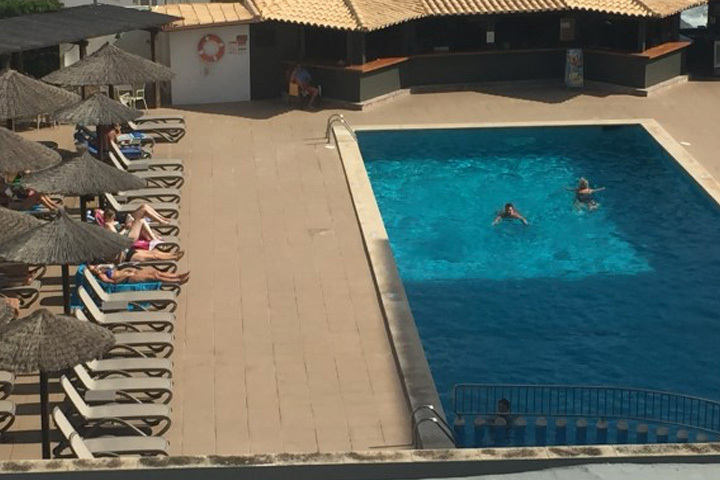 I had read on the internet that it was one of the greatest beachside resorts in Majorca and would have stayed there had the accommodation not been so expensive. It is a short drive from Cala Ratjada and as we entered the city the houses looked run down and dirty. By the time we got to the main beach we had passed many shops selling touristy crap and cheap alcohol. The beach itself had sand that was like mud and everything looked old and downtrodden. We had a snack of garlic prawns on one of the many expensive restaurants on the boardwalk followed by a swim amidst seaweed and fish. It was a big let down. After a few days in Cala Ratjada we headed over to the other side of the island for part two of our Majorca beach holiday, stopping at a few spots along the way. 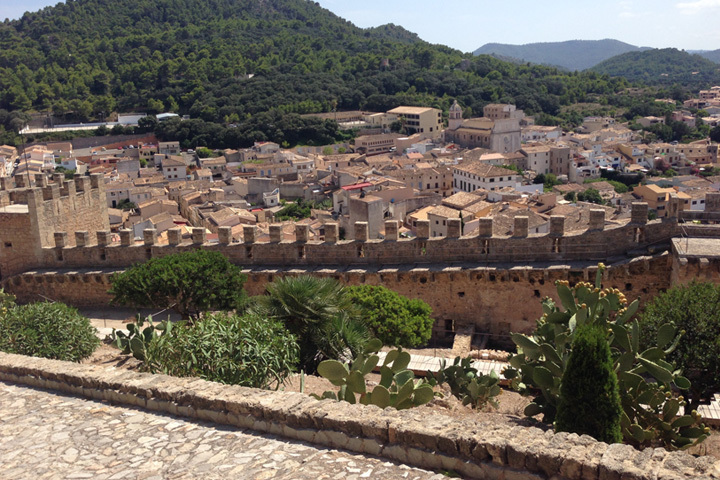 The first site was the Castle of Capdepera, one of the largest castles on the island and still in good condition. There is only a small entry fee to pay, however it is strategically situated on a steep incline and there is a lot of uphill walking required to explore the walled ancient town so I would not recommend visiting here in the midday heat as we did. The castle was built by the Romans in 310, however it was destroyed in wars and later rebuilt by the Christians in the 1400s to protect the inhabitants of Capdepera from pirates. The locals are proud of the castles history, as it was from here that James I of Aragon deceived the Muslims and conquered the neighbouring island of Menorca in 1231. Compared to other castles in Europe, it is small and simple, although the stunning views from the top make up for this. 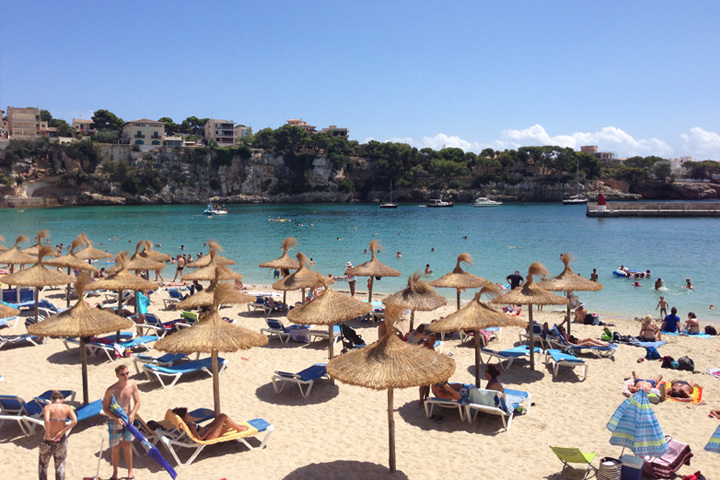 We then drove through the sleepy town of Manacor to Porto Cristo, which was my second favourite beach on the island. The beach itself is in a small naturally protected inlet amid rocks and trees, with decent waves, aquamarine waters and smooth white sand. 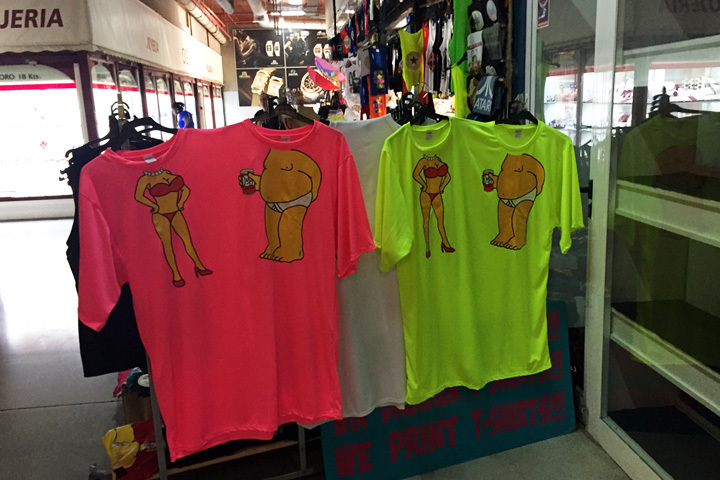 It also has a bustling boardwalk terrace lined with shops, cafes and restaurants. After this we visited the Sant Salvador Monastery that is situated at the top of a big 510 metre mountain in Felanitx. 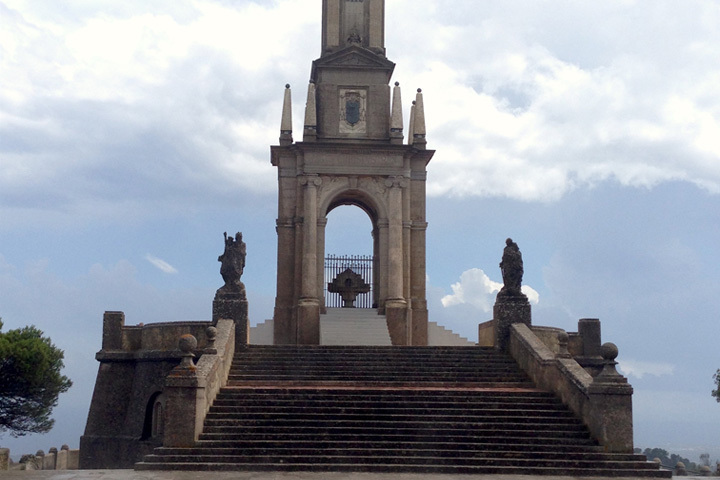 A primitive version was first constructed in1348 by the order of King Pedro IV of Aragon, and in the early 18th century the current structure as we know it today was built. 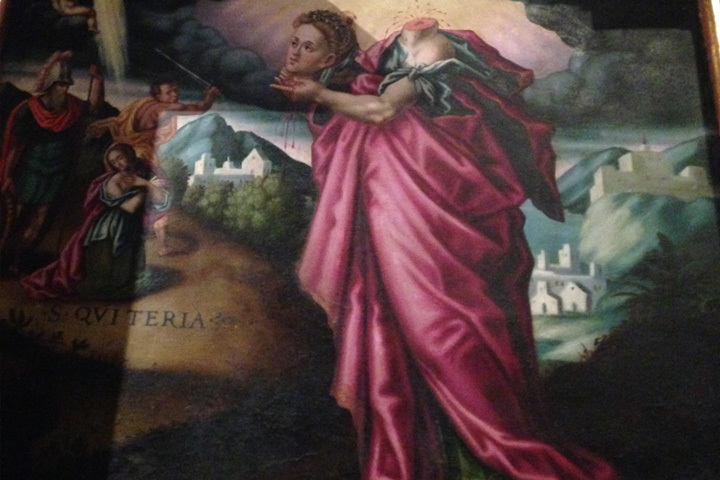 There is a church and a small chapel you can visit here with charming mementos to Our Lady as well as a darling courtyard. 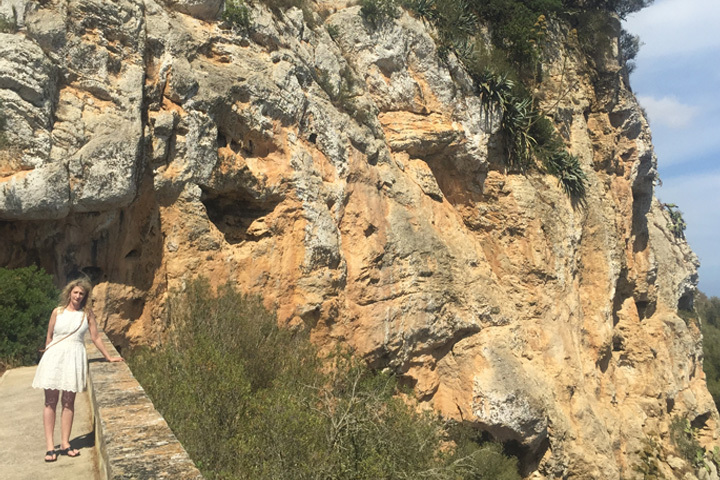 However most impressive are the large steps leading to a great altar with a statue of Our Lady that overlooks the hillside and diametrically opposite to a great cross standing on the summit of el Picot. 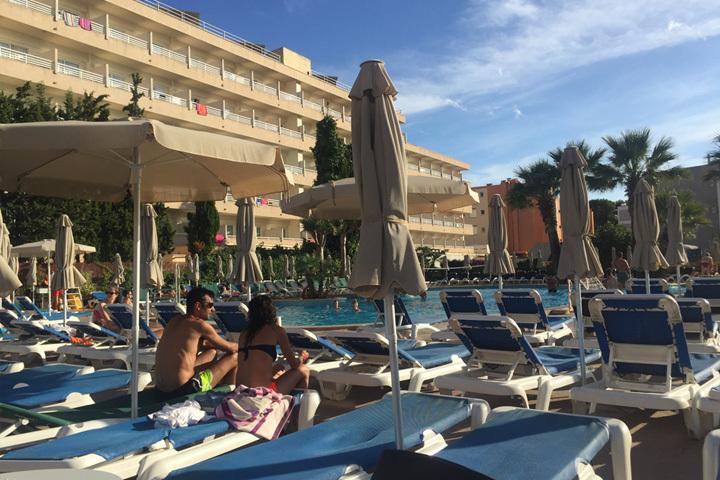 The second hotel we had booked during our Majorca beach holiday was located in Santa Ponsa called Viva Rey Don Jaime. The first curiosity was that the hotels reception desk was lined with greeting cards from happy customers wishing the staff well and thanking them for a great holiday. From some of the cards I noted that the well-wishers came here every summer for several years. It was soon apparent that this was an ‘all inclusive’ hotel and it was the first time we had ever been in such an establishment. The deal is that all meals, snacks and beverages are included in the price of the accommodation if you have the all inclusive package. Hundreds of people were staying at the hotel, especially families with children, but also groups of young adults on hens or stag nights. Meal times often took on the appearance of a feeding frenzy amongst orcs. The food wasn’t particularly good but there was a lot of it with three different buffets to choose from including cold food, hot food and desserts. There was also an unlimited supply of ciders, beers and wines to drink. Breakfast was the safest meal with a chef at the hot buffet either flipping pancakes or fried eggs on alternate days. Some of the evening meals were also acceptable. The worst horror was the evening they put on a cheese spread. 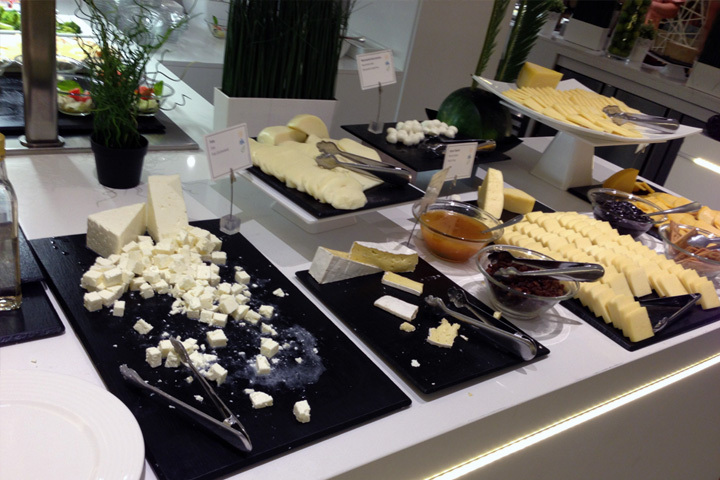 A whole buffet was covered with a variety of cheeses all pre-sliced and sitting out a room temperature. Some of the varieties of cheese were quite pungent, and by 8pm there were a number of flies and an interesting smell hovering over the spread. 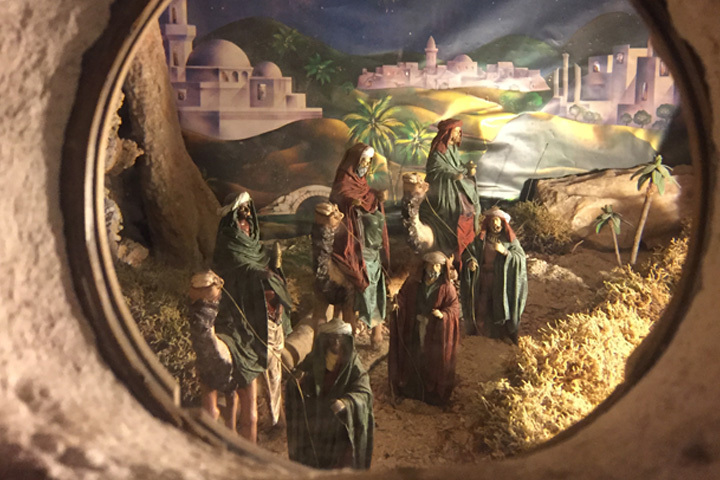 The second surprise was the hotel had activities planned around the clock for all age groups, from swimming lessons to aqua aerobics to a friendly game of darts, not to mention singing and dancing acts during the evening. Just by hanging around by the pool you could easily be roped into doing something by one of the many Activity Staff who were always present. I must admit we did start to enjoy the bingo, which started 9pm each night and we even won 500 Euros. There was also a fun Abba performance. However for the most part the entertainment was cheesy, particularly when we ended up in a limbo competition which made me realise I am not as young as I used to be. It may have pleased the masses but it made me feel I was trapped in an American movie! 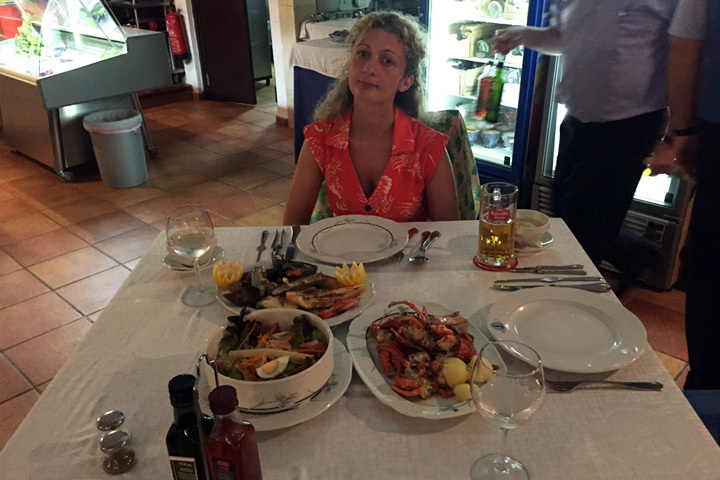 Despite taking advantage of the ‘all inclusive’ deal, we did venture out twice for dinner at a restaurant and on both occasions were impressed by the seafood. On the other side of the island the food was predominantly meaty with seafood paella standing out as the main seafood dish. 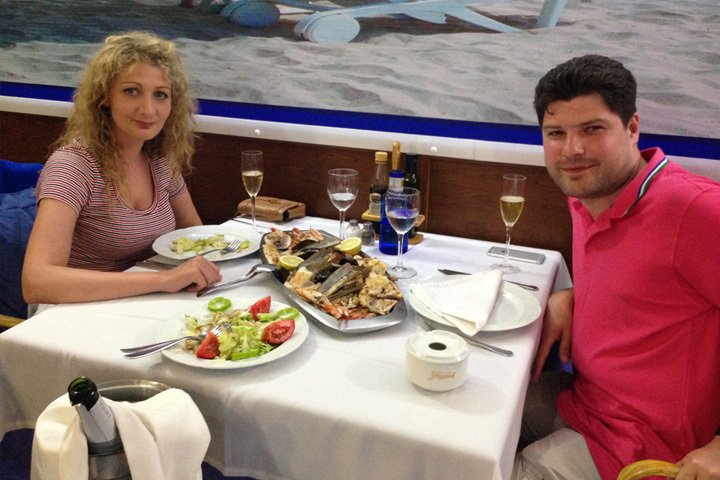 However in Santa Ponsa we discovered two great fish eateries. On the first evening we went to a little place around the corner from the hotel called Restaurant Reno. 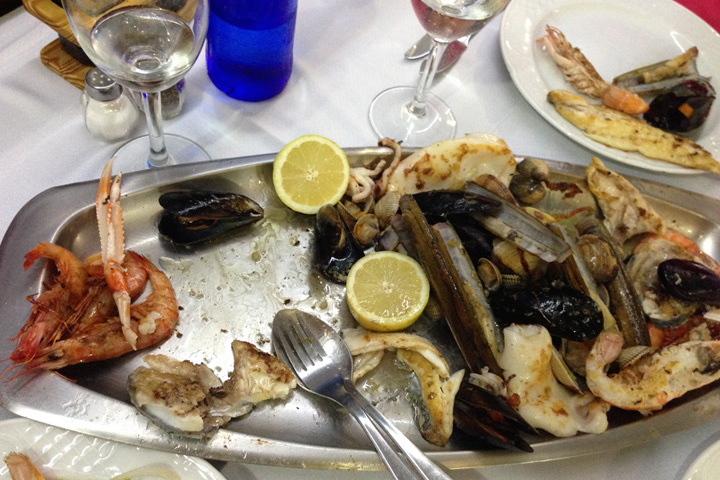 We ordered a seafood platter to share, which contained large prawns, fish, razor clams and mussels. The portion size was spot on and everything was cooked just right with a good amount of flavour. It was the first time I had ever enjoyed razor clams, which truly hit the spot! On our last evening we dined at an equally great place called Miguel’s, which is by the main beach and a little more pricy. This time we shared a small seafood plate for one consisting of fish, prawns, razor clams and mussels, which were all seasoned and cooked superbly, as well as a whole lobster steamed and served with garlic butter. 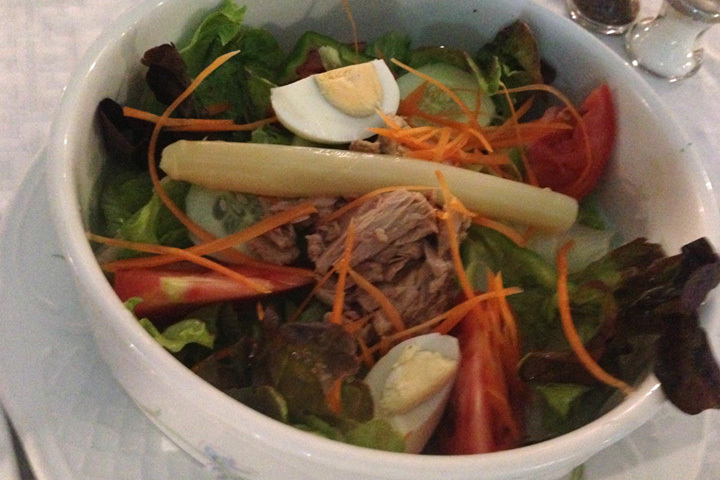 The only disappointment was the side salad that came with the meal, as it had been garnished with tuna and a cut boiled egg. 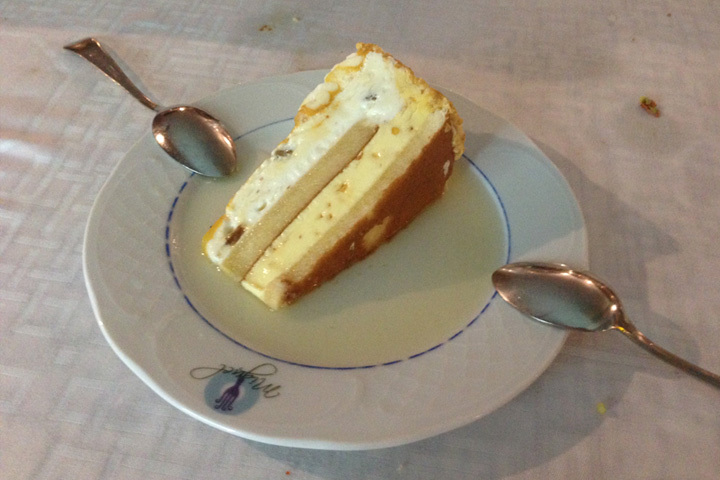 We finished the meal with a layered sponge and ice cream, with half a bottle of brandy poured over it and then lighted to give it some extra kick. The visual effects were better than the taste though. This end of the island is known as the British side and most of the tourists we came across were English and everything was written in English language. It is also known as the party side, and it attracts people looking for summer fun where the weather is good and the alcohol is cheap. 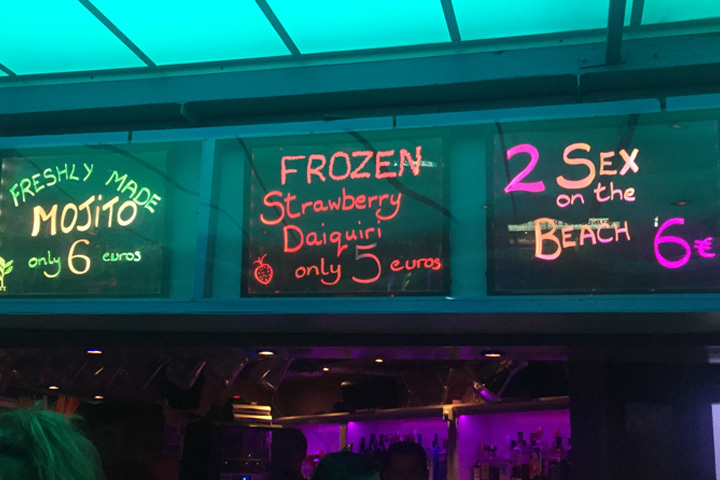 During the evenings we would spend a good portion by the hotel pool bar, queuing in a long line to buy cheap sugary sweet cocktails after dinner. Afterwards we headed into town where we had our choice of Irish pubs to get wasted in. Most pubs offer free shots of cheap spirit to get you in the door, and beers and wines were super cheap too although a little rough. 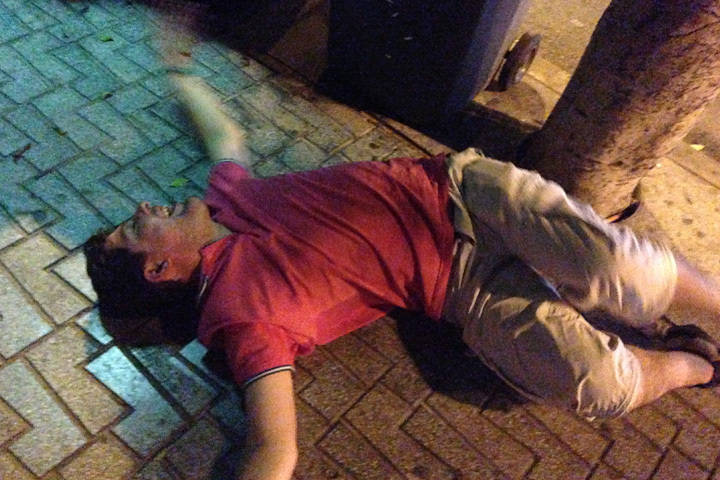 By 3am the streets of Santa Ponsa would be packed with drunken people spilling out of the pubs and into the McDonalds near the main beach. 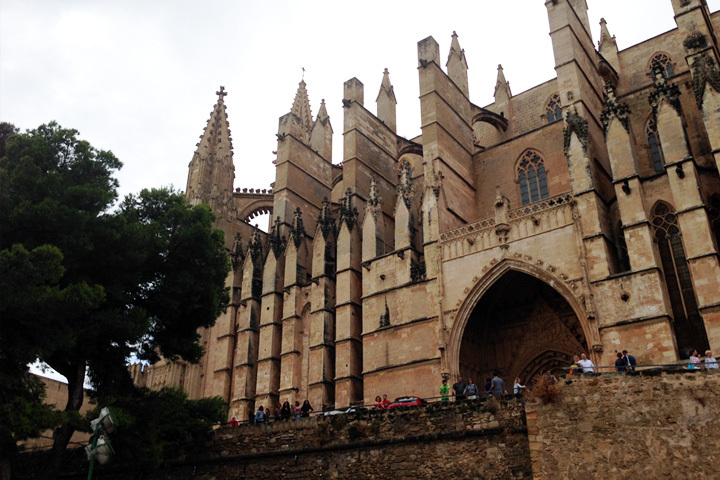 A definite highlight of our Majorca beach holiday was when we took a day trip to the capital and saw the Palma Cathedral. From the outside it looks a grand site as you drive along the coast. Inside, the tall ornate ceilings and stained glass windows are breathtaking. 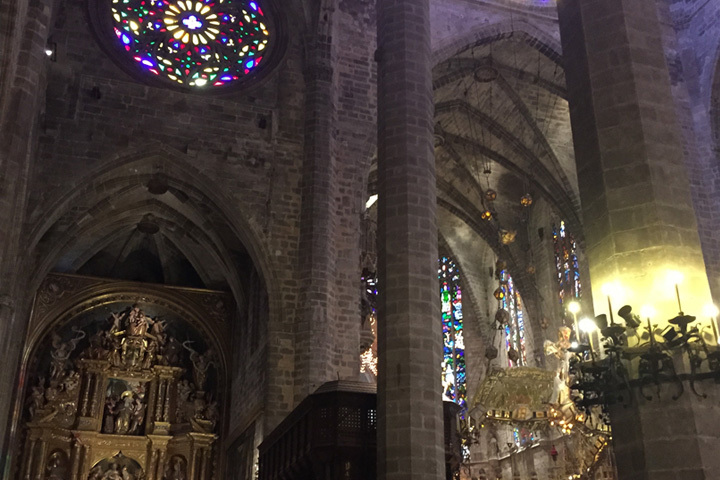 The cathedral was built between 1229 and 1601 in a Catalan Gothic Style and has the highest central nave of all Gothic Cathedrals. The capital also has a lot of very European small winding streets that are abuzz with activity and lined with all sorts of interesting shops and cafes. 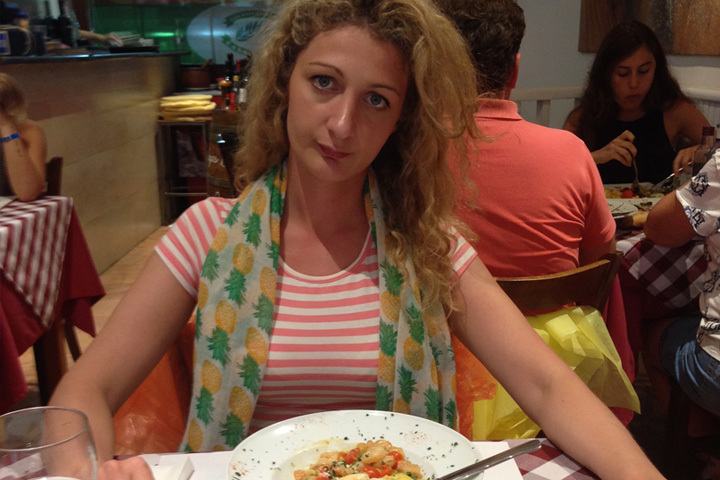 However I couldn’t help but notice that just like Cala Ratjada, there were more Italian restaurants than Spanish! 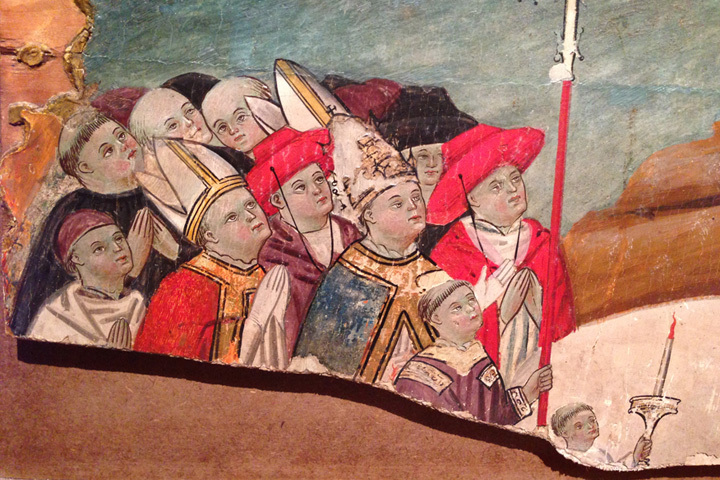 Perhaps the locals worship their Italian neighbours. On our last day just before heading to the airport, we visited the best beach of our trip, Cala Pi. It is a cosy beach on the southern coast that is surrounded by steep rocks and connected to a small village a little off the beaten track. There were still a fair share of tourists but the place had a good vibe about it and the water was warm and clear. 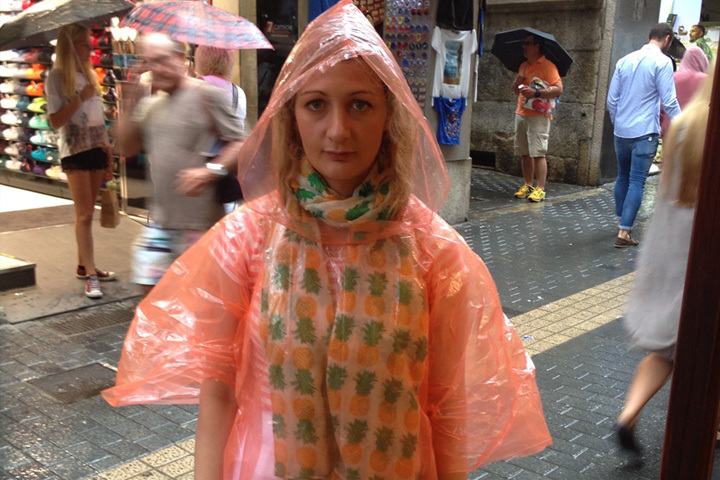 Our Majorca beach holiday was not our typical kind of holiday. However after a couple of days we fell into the flow of the island, turning off our brains and drinking cheap alcohol to our hearts content. We also enjoyed having a laugh at how touristy it was. I wouldn’t go back in a hurry however I can understand how this might be a desirable option for families with children, stag and hen parties, or people on a budget with a preference for packaged holidays.